Happy Monday, everyone!! With fall officially here I’m ready to pull out my layers, chunky sweaters, booties and change my wardrobe from the bright summer colors to the rich, deep jewel tones of fall. Tonight on Amazon’s live fashion and beauty show, Style Code Live, I’m sharing my favorite color to wear this season along with a few different ways to add it to your wardrobe! Be sure to tune into my segment tonight at 9pm EST/7pm MST here! Love maroon for fall. It’/ such a beautiful and bold colour for the season. Burgundy is one of my favorites in autumn! Maroon is my favorite color for fall! I love jewel tones for fall as well! Love that pink ottoman you are sitting on- where is it from? Thank you!! Yes I love these heels! They are really comfortable as well! I am loving these burgundy caged heels! So pretty! 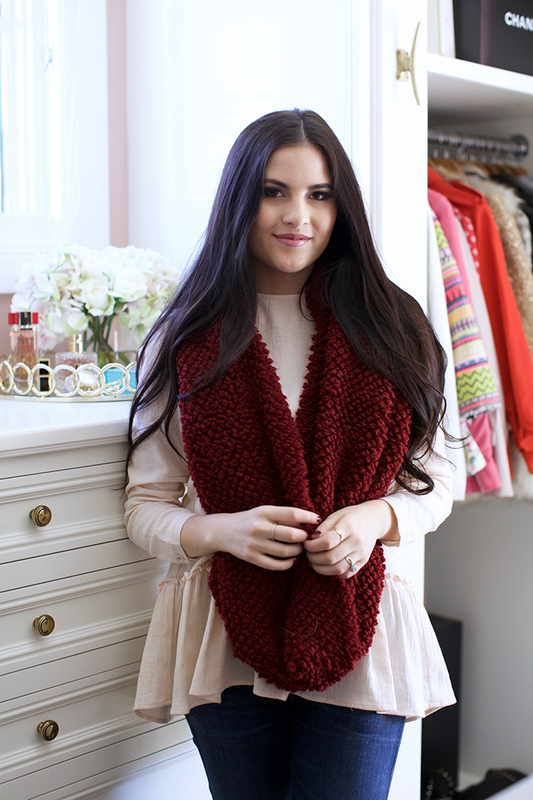 Love all these pretty, deep burgundy shades…I love pairing it with pink this time of year! Loving this color for fall!!! I love the maroon! Can’t wait to watch, Happy Monday! In LOVE with those shoes! Where are they from!? They are comfortable too! They are from Amazon and they’re Sam Edelman Women’s Yardley Dress Sandal! Yea, love burgundy for Fall! Looking forward to seeing your segment! Love those heels on you! They’re the perfect color! Those heels look amazing – and your shoe collection does too! Love this color for fall. I have a few items from last year that featured this color as well. You’re such a stunner!!! I love wearing burgundy in Fall! Ugh, wine/maroon is the absolute BEST fall color!! That hat is beautiful. Burgundy is such a pretty color especially with blush! I’ll have to watch tonight! You look stunning and I love those heels! Love the blush and burgundy combo. So soft and feminine! Can’t wait for the segment!! This is SO exciting! I need to start watching these! Love your shoes! They are off of Amazon! They are Sam Edelman from Amazon! Those shoes are amazing! I need them in my life. No me puede gustar más esa tonalidad, vino tinto. Preciosa. Love it! Jewel tones are perfect for the season! I’m loving burgundy, too, this fall! It’s such a gorgeous color and looks so beautiful paired with neutrals, as well as other rich, jewel toned colors! Your pieces are so beautiful and I hope I can tune in tonight to watch! Thanks so much for sharing, beauty, and I hope you have a great week ahead! Its a great color! Thank you! LOVE that top! The ruffles are so fun and feminine. Wine and maroon are my favorite fall colors! I’m loving your outfit here, you look amazing! Love this post! I’m so happy that fall fashion is back!! Burgundy is my #1 fav fall color. Absolutely love your sense of style Rachel! I love your shirt! Where did you get it? Great post! I’m obsessed with your shirt! Where is it from? You have such cool style!